Although midrange or budget cruises are the most common choices of most Halong Bay visitors, there is a wide selection when it comes to value and price for money. You can find some excellent midrange options providing cozy hotel-like cabins, professional on-board tour guides, and excellent kayaking stops at one end of the scale and some ultra-budget boats where on-board safety is not top priority at the other end. If you go on tight purse strings, it is sometimes better to choose a day cruise with a midrange operator rather than a bargain-basement overnight trip for comfort, facilities and safety considerations. 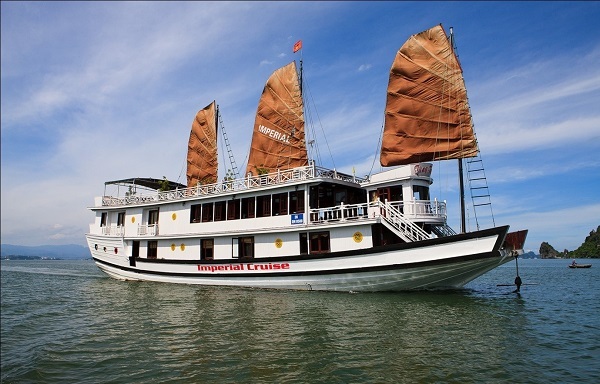 Fully equipped with a restaurant serving traditional Vietnamese style dishes with seafood being the stunning highlight of the meal, and a full bar, Imperial Legend is a traditional wooden sail boat. 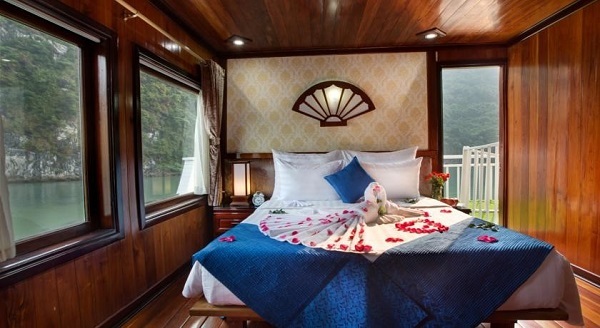 Stylishly decked out in wood and excellent furnishings with a private balcony and an en-suite shower room, all cabins can ensure you an awesome trip discovering Halong Bay. 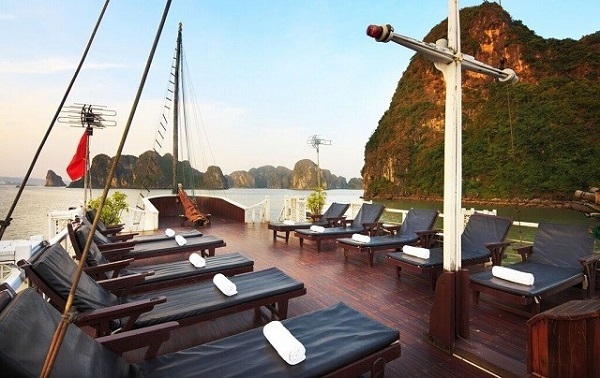 Unique in their routes going through Halong Bay and eloquent furnishings, Golden Sun cruise makes itself outstanding from the other 3-star cruises on which you can pay a visit to Ti Top Island. 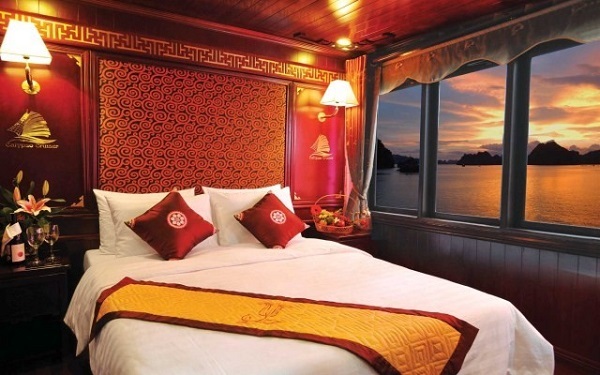 It is also one of the most stunning 3-star cruises for the budget price you can find in Halong Bay, Vietnam. Climb to the top of Golden Sun Cruise and you will definitely take some magnificent panoramic photos of the incredible bay below. 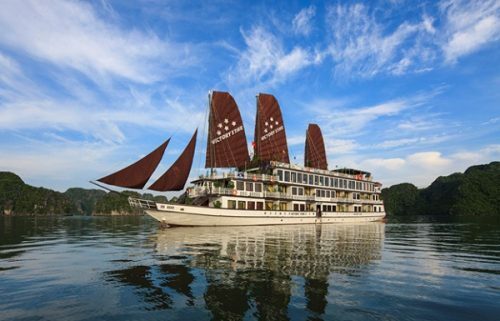 Cruise Halong Bay on off-the-beaten-track itinerary and enjoy comfort and leisure offered by truly hospitable crew on board, are what you can expect in these deluxe cruise options. For budget cruisers who are looking for a memorable and safety cruise in Halong bay while engaging with nice food, spotless cabin and knowledgeable cruise staffs, superior cruise is the best choice. 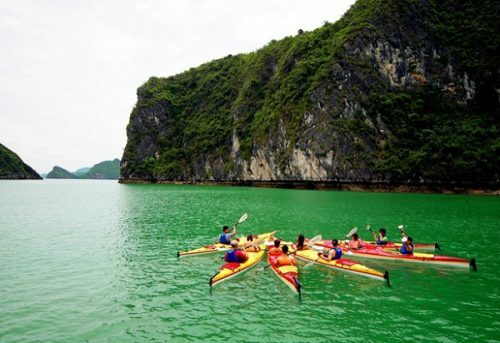 Calypso is the best selection for those who are young, dynamic and desire to take an unforgettable adventure trip in Halong Bay. If you want to experience rock climbing in Vietnam, Calypso cruise can satisfy you with the most comprehensive information and services. Rock climbing over the turquoise waters of Halong Bay, which is quickly becoming the most stunning way to enjoy this world-wonder Bay, must be the best way to get high in Vietnam.